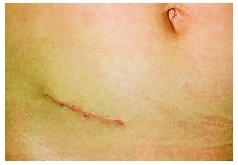 Appendectomy scar on the right side of the patient's abdomen. This technique provides images of infected areas and may help physicians decide which children are candidates for surgery to remove the appendix. Up to 20 percent of appendectomies are performed on infants and children with a normal appendix. American College of Emergency Physicians. Web site: http://www.acep.org. American College of Radiology. Web site: http://www.acr.org. "Appendicitis." Available online at http://kidshealth.org/parent/infections/stomach/appendicitis.html (accessed October 24, 2004). "Appendicitis." National Digestive Diseases Information Clearinghouse. Available online at http://digestive.niddk.nih.gov/ddiseases/pubs/appendicitis/ (accessed October 24, 2004). Trevino, M. "CT for Appendicitis Diagnosis in Children Gains Popularity." Available online at http://www.dimag.com/dinews/2003050901.shtml (accessed October 24, 2004). Tucker, J. "Pediatrics: Appendicitis." Emedicine. Available online at http://www.emedicine.com/emerg/topic361.htm (accessed October 24, 2004). I believe that hereditary ectopic uerters on the right side can also lead to ruptured appendix. A number of my cousins and I experienced ruptured appendix. I did not find out until I was an adult that I have double uerters on my right side which I believe is hereditary. I now believe my daughter has ectopic uerters because she frequently has enuresis. Hopefully amonly hers is on the left not the right. I do believe the farther research is needed to identify any correlation between the two.